Today I have a review of a product that is very new to me (although I know I'm late to the party on this). I tried out a chrome powder! 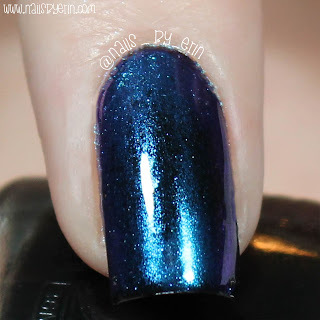 This one is the Mitty Chrome Powder in "Blue Bullet", which I was sent by Snail Vinyls. **I'm also excited to share with you guys that I have a discount code for Snail Vinyls! Use the code NAILSBYERIN at checkout to get 15% off! I started by painting my nails black and applying a layer of Sally Hansen Miracle Gel top coat. 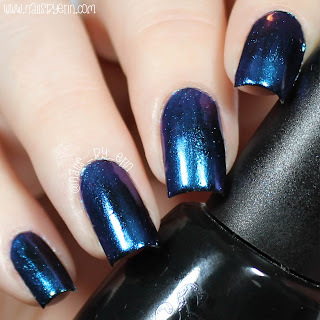 You have to use a gel top coat or a similar gel-like one in order to get the smooth chrome look. This chrome powder looks purple and blue in the photos, but in some lights there are even shades of teal and green that shine through! It is definitely one of those nail products that you can't stop staring at your nails. I love all the color shifts! The kit from Snail Vinyls comes with the chrome powder as well as two sponge applicators to apply it. Everything comes in a convenient, resealable pouch. In my first attempt at this, I don't think I applied enough of the chrome powder, and I also think I rubbed the powder too much into the nail and ended up rubbing it off. There was only a slight chrome effect, and there seemed to be more black then the color-shifting blue and purple. But on my second attempt, I rubbed the powder less and applied a little bit more! It definitely seemed to work better.